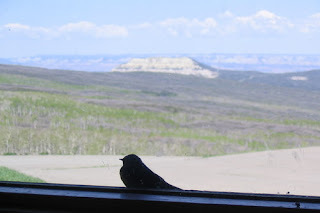 Powderhorn Mountain Resort: Curious Little Things Aren't They? 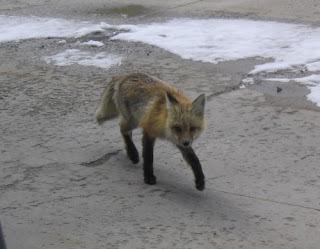 Various animals have been wandering around lately. They seem pretty curious about our daily activities. I'm not really sure why...most of us are rather boring to watch. Here is the swallow that sits on my window sill every day and watches me work. If he isn't watching me he must be tracking all the flies crawling on my windows. Me vs. the flies....so far they are winning. I would love to let this little guy loose on them. 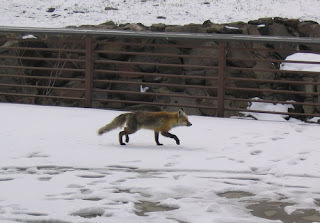 And here is another fox that came to investigate the goings-on at the Sunset Grille on Monday. Perhaps the most curious of all animals around the lodge are the chipmunks. These little guys will make their way into your office just to say Hi. Unfortunately we are not expecting their company when they drop in and the encounter usually involves some screaming and flailing of the arms. Last summer a chipmunk, who has apparently seen Mission Impossible, made his way into the rental shop through a cracked window, across the shop and into the main lobby, then through a vent into the Alpine Trader. He made this trip several times a day. Upon further investigation we found that he was a huge fan of Peanut M&Ms. By the time we caught him in the act, he must have stored up a full winter supply of colorful chocolate candies.